For quite a few years in the caravan world the trend has been towards ever heavier vans. Lately, however, a few manufacturers are looking at lighter vans for more economical towing. One of those has been Golf with its update of an old design, the Bushman Tourer. Designed very much in the Golf style, the Bushman has been built with one thing in mind: keeping the weight down so that it can be towed easily by something like the Holden Commodore we were using. Generally speaking the power/torque rating has not been the problem with using sedan vehicles for towing but rather the limitation of towing weights on the rear. The end result is a two-berth van that saves weight and length by having a single bed/lounge design, along with a reasonably sized kitchen and a corner bathroom. Not changed much is Golf’s timber look interior with its simple cabinetwork and unfussy appearance. A favourite with Golf is the split kitchen design across the rear and offside walls with the bathroom in between. Not everyone likes sideways facing lounges that work as seats by day and beds by night, but they do save on interior space. The Bushman bed/lounges are a decently sized 1.9m x 0.74m (6ft 2in x 2ft 5in) and offer comfortable seats as well as stretch-out room. Between the lounges is a cabinet that has a cupboard, drawer and flip-over table – a nice little space saver. The front lounge/dining/sleeping area has windows all round, which is reminiscent of Euro designs, although there is a little less window and a bit more wall area. Illumination is supplied by two halogen reading lights and an overhead fluorescent. For storage, both the bed bases lift up on gas struts to give access to most of the under-bed areas, and there are four overhead lockers across the front wall. Being a smaller length van, the kitchen in the Bushman is spread about rather than consisting of one bench along a wall. The offside bench is fitted with a stainless steel sink with drainer, the rear wall bench has a three-burner cooktop with microwave underneath, and the large cabinet by the door contains a 121L Dometic fridge and a pantry. One of the interesting features is that there is plenty of kitchen storage space. The rear cabinet has three overhead lockers and three below-bench cupboards. It also has a non-kitchen item – a small wardrobe with two drawers below. Around the sink bench are also three overhead lockers, three cupboards (one with a wire basket drawer) and a cutlery drawer. The sink is lit by a slimline halogen fitting and the cooktop by the rangehood halogen globes. Above the fridge cabinet is a shelf area that can be used for a TV, flatscreen or otherwise. On the wall behind are powerpoint and TV antenna connections, and fitted to the overhead cupboards above are an AM/FM radio/CD player. Tucked into the rear corner between kitchen benches is the bathroom. As you might expect, it is not particularly big but does have a Thetford cassette toilet with washbasin behind and a shower hose. The latter is fitted to the washbasin but can be extended up for use when showering. In addition to the 240V mains wiring, the Bushman has 12V lighting and a water pump powered by a 100Ah deep-cycle battery. A 240V 20A charger keeps the battery fired up but long-term free campers might have to think about solar panels. Like many a Golf caravan, the Bushman has been built based on a 100mm x 50mm (4x2in) DuraGal chassis that rides on Golf’s Positrack independent suspension, which has been around for a few years now and certainly seems to have stood the test of time (and use). For extra strength, the 50mm axle stubs are fitted with parallel bearings, not tapered. Al-Ko quick-drop stabilisers are fitted to each corner. The front drawbar complete with ball coupling, jockey wheel, mains tap and handbrake looks quite plain, but that is mainly because the 9kg and 4.5kg gas cylinders are hidden in the front boot and the spare wheel is mounted on a frame underneath the front of the van. Above the chassis the frame is aluminium, as is the cladding on the walls and roof. The only exception to this are the front nose cone and rear lower panels for which moulded fibreglass is used. On the road, the Commodore handled the Bushman with ease, and seemed to attract a few curious glances from those more used to seeing ‘boofy’ 4WDs in front of caravans. Granted, our Bushman was relatively empty and weighed around 1400kg, but even fully loaded at its maximum of 1790kg, it’s well within the towing capacity of the Commodore and doesn’t affect the car’s comfortable, sedan-like drive. The arrival of British and European caravans a few years ago made some of the local vans look a bit overweight, so it’s good to see an Australian-built van answering the challenge – especially in the current economic climate when rising costs are requiring travel to be more economic. Not everybody likes a single-bed layout, but it does provide flexibility and offers all the contemporary basic comforts with room to move and a bathroom. It also results in a caravan that can be towed by a sedan. 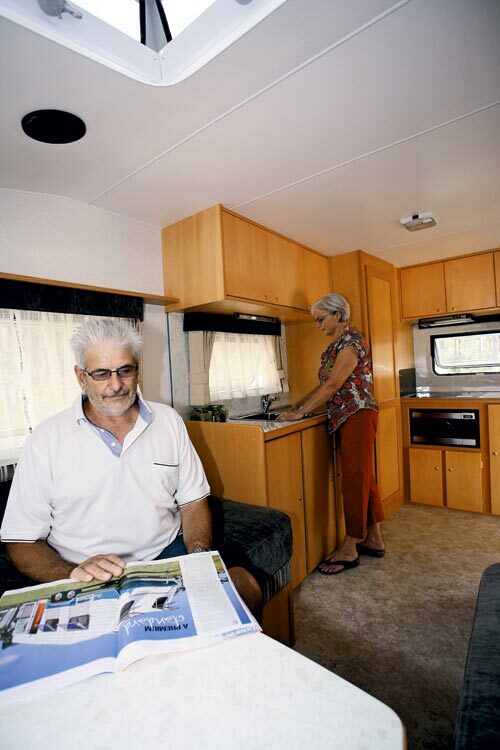 Arrow Caravans, 67 Radley Street, Virginia, Qld 4014, (07) 3265 5622, www.arrowcaravans.com.au. 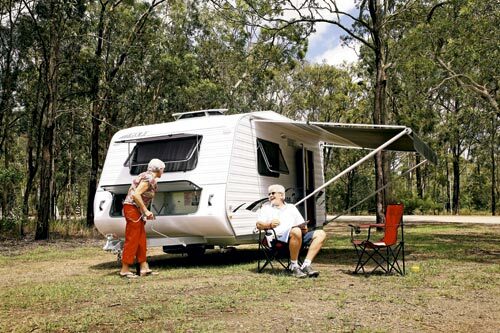 For more information on Golf caravans, including your nearest dealer, visit www.golfcampers.com.au. Special thanks to Village Holden, 1051-1059 Gympie Road, Petrie, Qld 4502, (07) 3205 0600, www.villagemotors.com.au, for the loan of the Holden Commodore and for specially fitting the tow hitch.